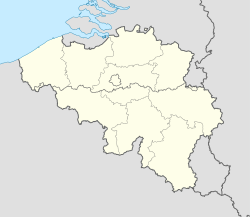 Welkenraedt (French pronunciation: ​[wɛlkɛnʁat]) is a Walloon municipality in the province of Liège, Belgium. On January 1, 2006, Welkenraedt had a total population of 9,163. The total area is 24.47 km² which gives a population density of 374 inhabitants per km². The town and former municipality of Henri-Chapelle is home to the Henri-Chapelle American Cemetery and Memorial which contains the graves of 7,992 members of the American military who died in World War II.